Lower ab workouts are essential to keeping your body looking fit, but only if these exercises are performed properly. Men can perform abdominal exercises and improve their diet, reducing your intake of junk food, to get six-pack abs and keep your body looking fit. The key to developing solid-looking abdominals is consistency. It can take months to get the body you are hoping for. Finding the right exercises for your body can help you achieve and maintain this body type more successfully. Those trying to engage the lower rectus abdominis muscles should focus on exercises that require you to lift your legs off the floor. In this case, lay on the ground with the legs stretched out and the feet together. Prop yourself up on the elbows, creating a 15-20 degree angle from the floor. Brace the core and extend your legs toward your feet, lifting the feet up toward the ceiling, creating a V-shape. Hold this position for 1-3 seconds and then lower the torso back onto your elbow and the feet back down to the floor. Lie on your mat and bring the legs up so they are straight above the hips. Bend the knees at a 90 degree angle, placing your hands beneath your lower back to add to the support. Contract the abs to bring your knees closer to your chest and hold in this position for around 3 seconds before returning to your starting position. Repeat 3 sets of 10 repetitions. Lie on your back with the arms out slightly away from your body with the palms down for balance. Lift the legs above the hips, locking the knees and squeezing the hips together. Draw a circle with the feet as large as you can, aiming to get as high above your body and as low to the ground as possible. You can reverse directions periodically to increase the difficulty. One circle is one repetition. Among all lower ab workouts for men, leg lifts can help you tone the obliques and lower abs. Lie on an exercise mat and raise the legs so they are straight up over the hips. Rest your hands palms down at your sides. Use your lower abs to lift your hips off of the floor, pulling them toward the ribcage. While doing this, turn your hips to your right side, holding in this position for five seconds before returning your starting position. Repeat on the left side, performing three sets of 10 repetitions on each side. Balance with your right hip on a Swiss ball, leaning into the ball so you do not fall and pressing your feet against a wall to prevent rolling. Place your hands up near the ears and contract the oblique muscles on the left side so you can lift the torso up as high as possible. Hold this position for 3 seconds before releasing. Perform 10 reps of this exercise on each side. Working with a stability ball helps you to get more out of your strength training routine. Get on all fours and place the stability ball beneath your torso. Walk the ands forward until your feet are on the ball and the rest of your body is in the air balancing over the ball and your hands. Engage your core and pull the knees toward your chest, keeping your hips pointed toward the ceiling. The ball should roll forward under the shins to keep your feet in the air. Hold the position for two seconds, then extend the legs and roll back into the starting positions. Repeat this motion 10-15 times or until you are fatigued. Lie on your back with the knees bent and the feet on the floor about shoulder width apart. Contract your abdominals to pull the torso forward, creating a diagonal line between your knees and shoulders. Hold the position for three seconds then return to your original position. Perform three sets of 10 repetitions each. This one definitely should make your list of best lower ab workouts for men. This exercise helps to isolate your lower rectus abdominus muscles. Attach your arms to a harness on a chin-up bar and allow your body to hang below. Keep your feet together and pull your knees up as close to your chest as you can get them. Pause when your knees are raised, squeezing the abdominals for 2-3 seconds, then lower your legs back to the starting position and repeat. This exercise will help you work the upper and lower rectus abdominis muscles at the same time by providing heavy resistance. 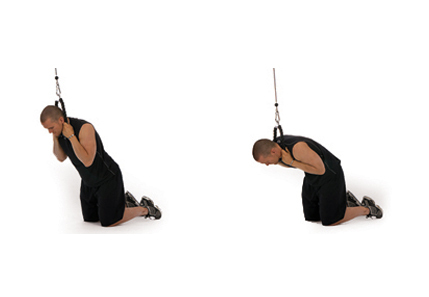 Attach a rope to a pull down machine, keeling beneath it and grasping the rope with both hands. Hold this rope near the top of your forehead and crunch down toward your knees, bringing the head to your knees as you lower yourself. Hold yourself down in this position for a few seconds, then raise yourself up slowly and repeat until you are fatigued. Add around 25 pounds or a weight you are comfortable with to a pulley machine, grasping the rope around shoulder height with the left hand. Stand square to the machine, and then take a couple steps to your right to create tension on the rope. Bring the right arm across your body while clasping the hands together around the handle. Make sure you keep your arm straight at shoulder height while trying to bring your arm as far across your body as possible like the motion you would make while chopping wood. Return to the starting position and repeat 10 times on each side. Now you have known the 10 best lower ab workouts for men, start to make your own workout routine to tone your abs!